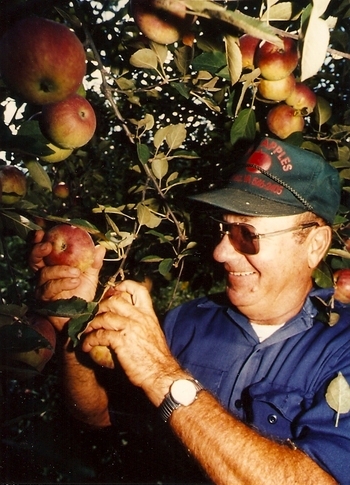 In business since 1990, Jim's Apples has more than 400 trees, consisting of more than 70 different varieties of apples. These are not the bland apples you may find in your local supermarket, but instead include many heirloom varieties, including Wolf River, Pippin, Arkansas Black, and others. In October 2008, we were featured in Martha Stewart Living magazine. Visit our orchard, located on State Route 612/Kane Gap Road, approximately two miles east of U.S. Routes 58/421, in Stickleyville, Virginia, or our sales location, also on State Route 612 (at 1054 Kane Gap Road), just a mile east of U.S. Routes 58/421 (click here for map), or contact Larry Hobbs via email at larry@jimsapples.com for more information. If you are interested in staying near the orchard, we now offer a three-bedroom farmhouse for visitors to rent, just a mile down the road. Click here to visit our rental website. As always, ripening dates and fruit availability can vary due to weather conditions and other circumstances. For the latest information from the orchard, follow us on Twitter @jimsapples or visit us (and "LIKE" us) on Facebook by clicking here.